Steaming your food offers various health benefits. Not only that, but it can also help you to preserve your food and serve a more nutritious meal to your family. Hence, for every kitchen lover out there, you should consider investing in a food steamer. We have created a list of the top 10 best food steamers that you can choose from. The following are the most innovative, sleek-looking, and functional food steamers that you can choose from. Be ready to enjoy 100% super healthy foods from now on. First on the list is the Cuisinart STM-100 food steamer. This unit is made of stainless steel and digital glass. It also features a 5-liter dishwasher-safe glass pot along with a wide LCD control panel. There are stop and start button options, pause, and even reheat food if you want. If you are still new to steaming, their pre-programmed food settings can help you. This food steamer has a 1-liter water tank that you can remove for easy cleaning. Its stainless steel steaming tray and glass lid with stainless steel rim is built to last. It features a 60-minute countdown timer, audible alert, and the steaming tray can hold different types of food—there’s no exception! For consumers looking for a healthy way to cook their food, this easy-to-use, and sleek-looking food steamer is the one that you are looking for. 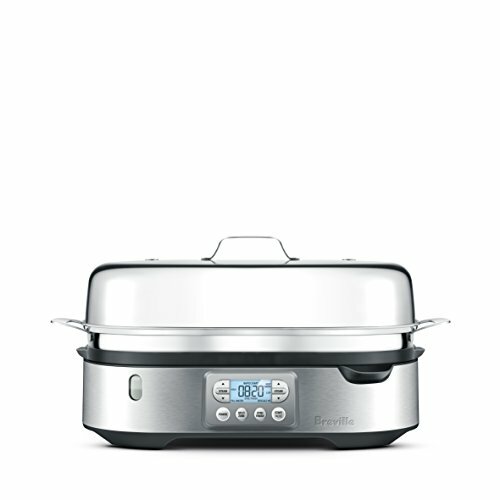 For customers on a budget, you might want to check out the Breville food steamer. The steam zone is located just above the water. It also has an extra-large steaming tray compared to the previous product that we’ve reviewed. For kitchen lovers who are looking for simultaneous cooking for foods that require different steaming times and power, this is the one for you. You can sync it on or off anytime you want. This unit can provide its maximum steaming power in less than 30 seconds, allowing you to cook faster compared to other units. The buttons options available are high, low, high keep warm, low keep warm, and keep warm. It also features a rapid start technology that in just one touch, you can automatically start steaming your food. For a quick and healthy meal preparation without breaking your back, this is the ideal unit for you. 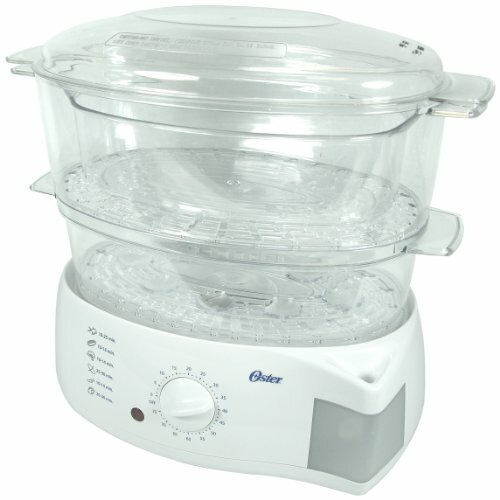 Next, we have the Oster quart food steamer in sleek white color. 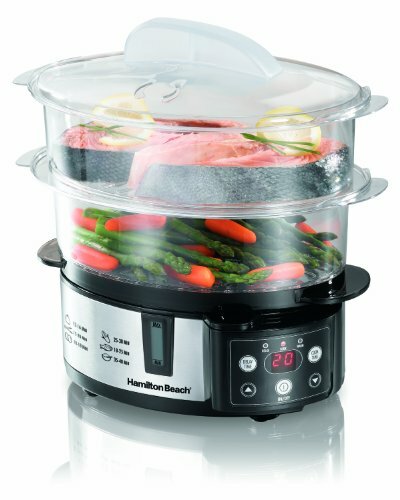 This 2-tiered 6.1-quart capacity steamer is perfect for kitchen lovers who want to prepare all kinds of foods as they wish. You can delay cooking for up to 12 hours, perfect for dishes that requires overnight preparation. Its clear LCD offers a 95-minute timer and auto keep-warm setting. This unit also has an external water-fill system with a see-through reservoir with fully collapsible steaming trays. The package includes a 3.8-quart and 2.3-quart steaming bowl along with eight egg holders for both soft and hard-cooked eggs. This versatile food steamer is perfect for holidays, Sunday brunch, of picnic times. You can start steaming right away thanks to its instant-steam function—an ideal option for busy working moms. Adding water does not require you to remove the steaming bowl any more thanks to the exterior water inlet located on the base of the unit. Designed for more cooking options that you can choose from, the Hamilton beach digital food steamer is the perfect unit for you. With two tiers and a removable diver, you can use it to separate the food and steam at the same time. Or you can remove the divider to accommodate larger foods. Once the food is ready, the unit will automatically switch to warm mode. It can fit corn on the cob or even a head of broccoli. 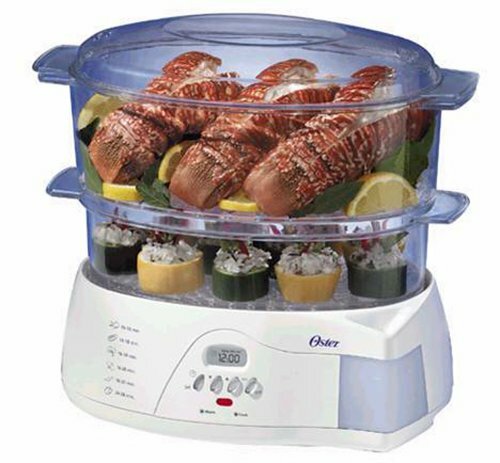 This unit is ideal for steaming delicate fish, lobster, and other foods. The package includes a rice bowl that allows you to steam white or brown rice or even smaller foods. It’s versatile and offers friendly-user buttons and optimal professional results when used correctly. When the food is ready, you will know by the beeping sound that it will emit. 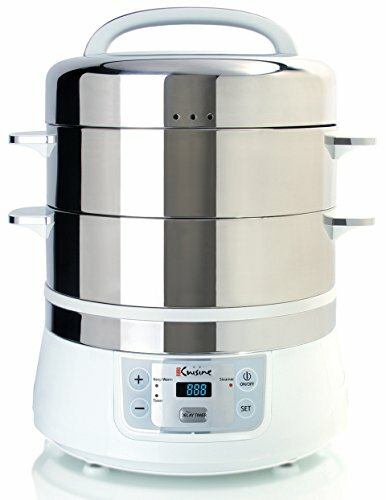 Check out the Euro Cuisine food steamer made of stainless steel that is bound to last. Its steel steam basket can help in preserving the original flavor of your food and its nutrients. Rest assured that it’s safe to clean and easy to start cooking. This 2-tier of 8.5 quarts each basket has a removable steam basket that provides optimal convenience. You can use either hot or cold water. It can generate steam in just a short time, allowing you to prepare your meals fast and easy. It also features an auto shut-off when the cycle is completed, so you don’t have to watch or even have the guesswork. You can let the food cook as soon as possible. Its 4.5-quart water holder, automatic 90-minute timer, and automatic switching to warm mode when the food is ready are perfect for beginners in the kitchen. Now you can prepare delicious and nutritious food whenever you want without difficulty. 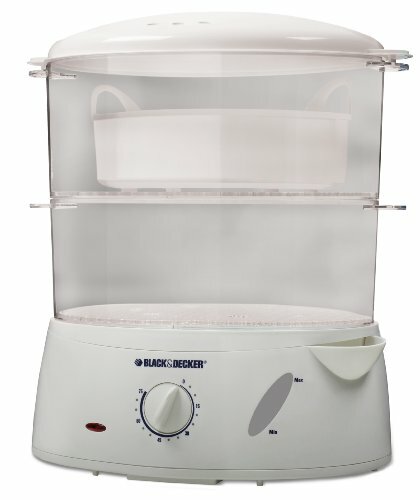 Now you can prepare nutritious foods anytime you want thanks to this versatile 7-quart food steamer from Black and Decker. Featuring a 4-quart basket, 3-quart basket, 5-cup rice bowl, and 12 egg nesting basket, you can cook whatever you want. It also has a water window for increased visibility and an external water inlet for easy water changes. The 75-minute timer with “ready” bell will notify you when the food is ready to serve. Aside from that, it also has a flavor center screen for your herbs and spices. There is nothing you couldn’t cook with this product. 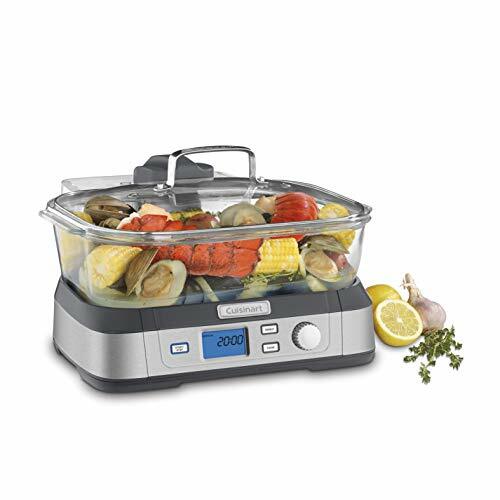 It’s a convenient way to steam vegetables, chicken, meat and add some water, wine, spices, and you’re good to go. Buyers can enjoy up to one-year limited warranty upon purchasing the product. 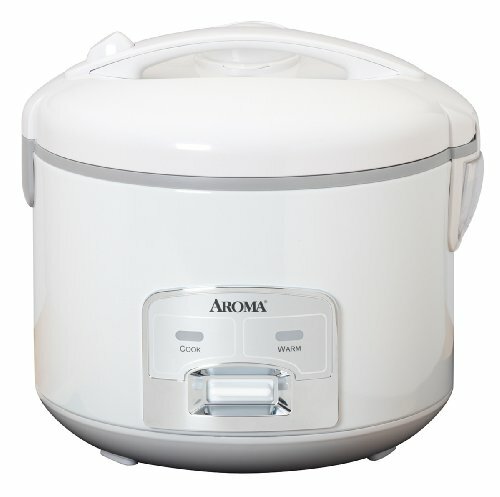 The Aroma Housewares cup rice cooker and food steamer are two cooking options in just one unit! It can prepare from 4 to 16 cups of rice. Its ability to evenly cook meat and vegetables will give you the confidence to explore the kitchen more. We also like its simple one-touch operation that you will switch from keep-warm mode when the food is ready to serve. The nonstick inner cooking pot is removable, and it’s easy to clean. Rest assured that the food is always served hot and delicious because it maintains the temperature even after it’s cooked. It also features a water reservoir that will rid of any excess condensation for rice that’s light every time it can detect one. The package includes a measuring cup, steam tray, and serving spatula. Another product from the Oster is this sleek-looking white food steamer. If you are willing to spend an extra few dollars, you can enjoy the fast-steaming unit and cook your food right away. This double-tiered 6.1-quart capacity can hold any foods that you can think of. It also features a 75-minute timer with an auto shut-off setting when food is ready to serve for your safety. It also has a see-through external reservoir that can help you to ensure a stable steaming. The package includes 3/10 quart steaming bowls, collapsible steaming trays, and it also contains eight egg holders. This food steamer is perfect for beginners thanks to its user-friendly buttons and easy-to-use design. Now you can experiment in your kitchen with confidence and assurance. For tech-savvy cooks, check out this sleek-looking food steamer from T-Fal. This double-tiered unit can accommodate up to 4 quarts. You can remove the divider between the two tiers to fit larger foods inside. It also features digital and professional controls with a 60-minute timer. We like its compact size for easy storage of the product after use. This unit is perfect for cooking delicate foods such as fish, meat, and vegetables that are prone to overcooking. Unlike other products, this unit is quiet and does not produce any unnecessary noises when operating. Thanks to its solid construction, you can enjoy this product for many years to come. Buyers can enjoy up to one year of limited warranty upon purchasing the unit. 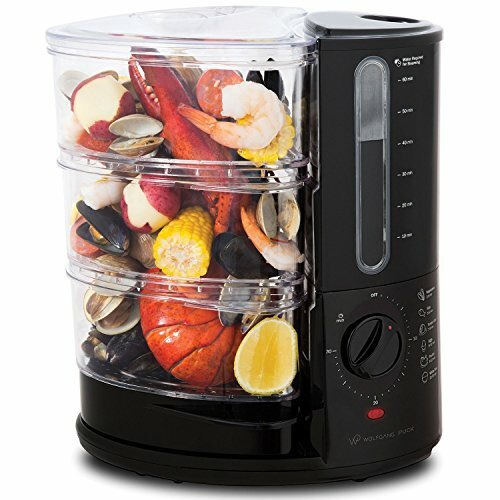 Lastly, we have the Wolfgang Puck food steamer that can cook in one, two, or three baskets at a time. The rapid heating boiler will automatically start generating steam in just 45 seconds, allowing you to prepare meals fast and effective. This unit is ideal for busy professionals because of its rapid steaming capability and user-friendly design. The package includes three 3-quart BPA-free baskets with stainless steel bottoms for easy cleaning. As mentioned above, the simple operation of this product makes it more appealing for beginners in the kitchen. 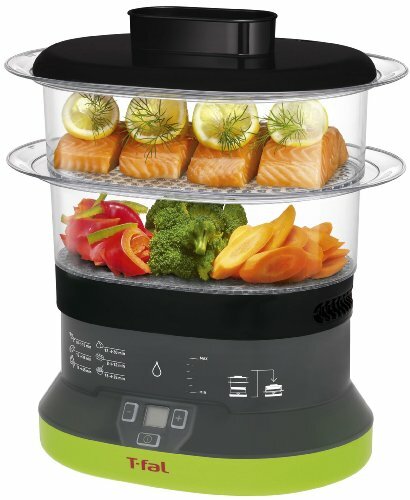 Just remove the water tank, add the food, and within only 45 seconds, you can start steaming your food to your liking. You can nest the steamer baskets in one another for compact storage after using the product.